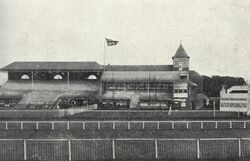 Blackhall Racecourse was the location of the 11th Border Regiment (Lonsdale) Battalion Headquarters in Carlisle, Cumberland. It was the primary site used as a base of operations during the initial formation, recruitment drive and training of new soldiers before they were shipped overseas to fight in France and Belgium from 1916–1918. The Lonsdales at Blackhall was a decision based on several qualifying points, ultimately sanctioned by the Territorial Association. The site was required to have enough space for training in drill, manoeuvres and parading, and there had to be allowances for accommodation and office space. Blackhall was able to fulfil every requirement for a suitable military training ground. On 17 September 1914, approval of the Army Council was given (War Office letter No. 20/Gen. No./3162 (A.G.1) and an Executive Committee was formed. Hugh Lowther, 5th Earl of Lonsdale and the Executive Committee decided to raise the "Lonsdale Battalion" in three detachments: Carlisle, Kendal and Workington. There were four companies in the three detachments: A and B Companies from East and North Cumberland were based at Blackhall Racecourse, C Company from Westmorland was based at Kendal, and D Company from West Cumberland was based at Workington. With war Office approval Lord Lonsdale was the powerhouse behind the formation of the Lonsdale Battalion; a unit in his own name funded with his own money. He brought the battalion together by appointing officers and ordering the weapons and munitions needed to arm his men, all at personal expense. The supply of uniforms did cause some issue. Not everyone had their own uniforms and those that didn't had to train in their own civilian clothing until a time uniforms could be supplied. 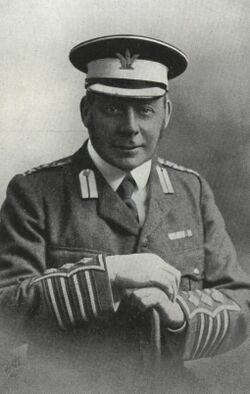 Lord Lonsdale designed the uniforms himself, his preferred choice being khaki. However, "as khaki was then unprocurable, the uniform was at first of dark grey cloth, similar to that of the old Cumberland Volunteers; but some two or three months later a proper khaki-coloured uniform was supplied." As the harsher northern border weather closed in "neither blanket nor greatcoats could be obtained, Lord Lonsdale sent down a thousand of each from London." In addition, he also supplied "an ambulance waggon, a water-cart, with two pairs of black horses, and later on obtained thirty chestnut mules for the transport." When it came to insignia, the cap badge had to be distinctive and immediately identifiable. Lord Lonsdale's own crest was authorised for use, personally presenting a silver cap badge to every enlistee in his battalion. He wanted the best for his men and he wanted them to look the part. Choosing the right officer to command any battalion has to be a carefully considered decision. Lord Lonsdale asked retired colonial officer Percy Wilfred Machell, C.M.G. if he would consider returning to a position of command. Machell had spent much of his military career in Egypt, having served in the Nile Expeditionary Force, the Egyptian Army and Egyptian Coastguard, among others. When asked, he was living in his substantial retreat at Crackenthorpe Hall, near Appleby, Westmorland. A return to the military would shake the foundations of a quiet country life but he accepted and was granted the temporary rank of Lieutanant Colonel, which was eventually Gazetted on 15 October, 1914. By this point though he had spent his first month in post at Penrith, where he had made his headquarters, but on 17 October, "along with the Orderly Room Staff and Lieut. and Quartermaster Dawson, moved from Penrith to Blackhall and in a very short time the organisation of the four companies was in full swing." Machell's prior knowledge of command enabled a structured and order approach to getting the required job done. He was by no means a cold and emotionless man, instead he was considered a caring man and was respected among his men. During October and November there was much "spade work" to be done. All manner of duties were done by himself in the early months. 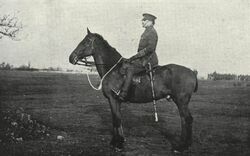 He was constantly busy with preparations having no Company Officers until his Adjutant, Captain P. G. W. Diggle of the 6th Border Regiment, was appointed on 3 December. However the "insult" was worded, it didn't have a disparaging effect as the fallout of it's print might have suggested. The recruit rolled in, joining the ranks of the newly-formed Lonsdales with fervour, the need to "do one's duty" and, for many, the hope of a regular meal, warm clothes and one shilling a dayfor the trouble. 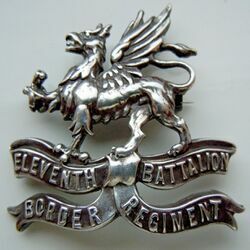 On 3 December, the same day Captain Diggle was appointed the role of Adjutant, the War Office conveyed that the Lonsdale Battalion was officially to become known as the 11th (Service) Battalion, Border Regiment (Lonsdale). 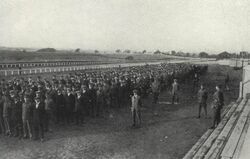 During December the hutments were being built as to accommodate the increasing number of recruits. One month later on 3 January 1915, the Lonsdale Battalion had reached a total strength of 1,152 non-commissioned officers and men and on 5 January all four Companies were now stationed at Blackhall and the Battalion was, on paper, attached to the 124th Infantry Brigade, commanded by Brigadier-General Collings. Training would continue in much the same manner until the men, some just boys, were deemed ready for battle. They were not ready just yet. The various skill-sets included scouts, stretcher bearers and signallers. Digging entrenchments and bayonet fighting had to be second nature, as would firing a Lee-Enfield rifle and being able to handle the water-cooled Vickers machine gun, which would in late 1915 be replaced with the lighter Lewis machine gun. The Lonsdales were transferred to the 112th Brigade on 16 March 1915, under Brigadier-General Mackenzie. The work the officers and men had put into creating a disciplined and well-trained unit did not go unnoticed when those who inspected Blackhall during March 1915, reported to Lt-Col. Machell that his Battalion was "far ahead of other service battalions." The Lonsdales were starting to turn heads in the upper echelons of the Brigade. This was a good sign. On 8 May the early group of recruits that formed the initial strength of the Battalion would finally leave Blackhall for training grounds beyond their familiar home counties. Their first port of call was Prees Heath Camp in Salop (present-day Shropshire) where the Lonsdales joined the proud Glasgow men of the 15th, 16th and 17th Battalions of the Highland Light Infantry, forming the 97th Brigade under the command Brigadier-General Hacket Thompson. The Borders and Highlanders, however, moved on again to Wensleydale in Yorkshire on the 22 June owing to the unsuitability of the ground for Brigade Training. There they remained under canvas until the beginning of August, forming part of the 32nd Division under Major-General Rycroft. At 1am on 23 November 1915, the Lonsdale Battalion left for France with the rest of the 97th Brigade, now under the command of Brigadier-General Jardine, on board the steamer, the Princess Victoria. Their time at Blackhall, Prees Heath, Wensleydale and Salisbury Plain had come to and end. The previous months' training would now have to be addressed in real combat situations, putting into practice the skills and tactics they had developed over the previous year. To stay alive and come back home to Blighty would have been the first, and last, thing on their minds as they sailed towards the unknown in a war that was to last another three bitter, long years. ↑ 2.0 2.1 2.2 2.3 2.4 2.5 2.6 2.7 The Lonsdale Battalion Border Regiment, September 1914 to June 1915. ↑ The Earl of Lonsdale was appointed Chairman, with Colonel Weston, M.P., as Vice-Chairman, Major Binning, Mr. F. R. Hodgson, and Captain Wakefield were appointed Goveners of Local Committees, at Carlisle, Workington, and Kendal, respectively, and Mr. Gerald Spring-Rice became Hon. Secretary of the Executive Committee. ↑ The position of Adjutant was later appointed to Lieut. M Gordon. ↑ Chris Baker. British Army rates of pay The Long, Long Trail. Accessed 26 February, 2017. ↑ The inspector of Recruiting from the War Office, the Musketry Staff Officer from Headquarters (Western Command), and a Staff Officer for Physical Drill (Inspector of Gymnasia). This page was last edited on 17 November 2017, at 20:12.